today i have Inni Nail Vinyls in the design Christmas (simply use the search feature on www.inni.com and enter in Christmas to find it... there are other designs named Christmas, but this one is by Katja) to share with you all! 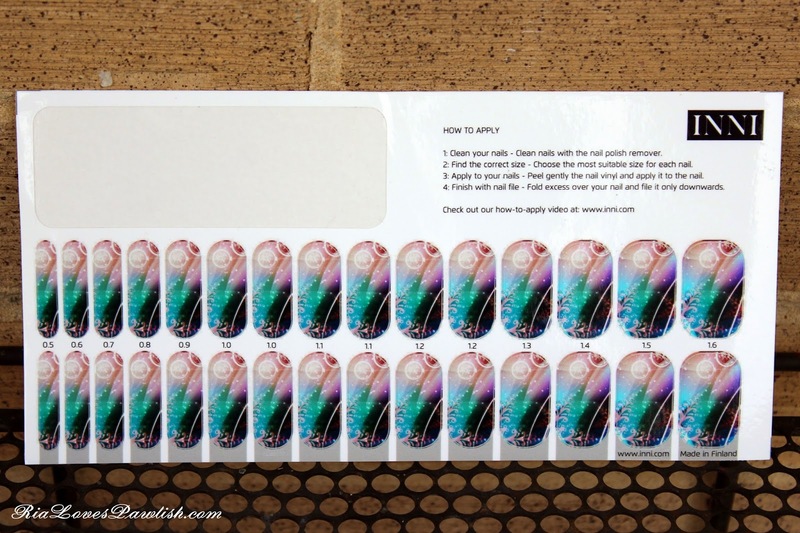 these were kindly sent to me as a press sample for review :) Inni Nail Vinyls are a new nail wrap that are made of vinyl and apply exactly like a sticker. they don't need topcoat, and simply peel off when you are done with them! i love the ease of it, i know other wraps require water and other things... since these were my first experience with wraps ever, i think i would be hard pressed to ever try the other, more difficult/effort required, wraps! here's a look at Christmas! definitely made some mistakes with my application, and i do think there is a learning curve involved. you find the video from Inni instructing you on application here! in the video there is a little ruler at the top of the sheet, but mine didn't have one, so i just laid my finger against the strips and guessed. this is probably not the best method, as i kept choosing ones too small! since they are stickers, you can simply put them back if you get the wrong size. i used a cuticle pusher with a rubber tip and the Revlon File-n-Smooth Nail File for application. 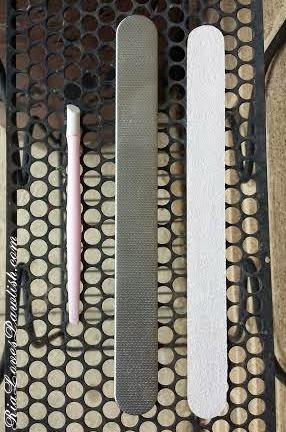 the cuticle pusher i used because i had seen it used in an application video for other wraps and it seemed like a great idea. i used the Revlon nail file because i couldn't find the file i was sent to use... i, of course, found it still in the envelope after i was done! i swear i checked there multiple times... sheesh. the good thing is, i can definitely recommend that you NOT use these metal files, it didn't work as well as the more traditional cardboard one would. here's a look at the tools! including the file i *should* have used. before you start applying, i recommend *not* applying lotion... this is my usual routine before polish application, but i feel it kept the vinyls from from bonding as best they could. also, rub your nail really well with polish remover or acetone right before you apply... i just did a cursory swipe and i don't think i got my nails clean enough. 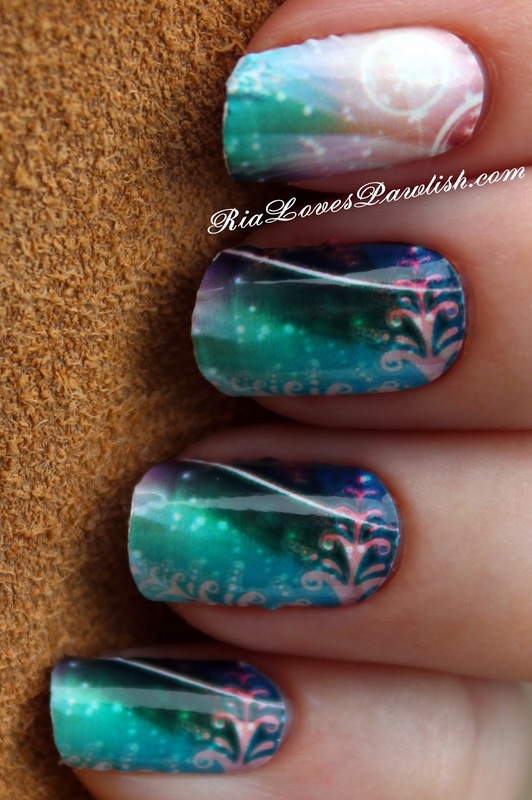 once you are ready, get the sticker right down to the cuticle and press it down towards the sides and top of the nail. Inni recommends that you stretch it/pull it a bit as you apply! i then used the cuticle pusher to really get the sticker under my cuticles all around my nail for a more seamless look. i did get a little wrinkling... i think it's just going to take practice to get better at application. once they are pressed completely, fold the excess over the nail. i made the mistake on some nails of sticking the excess together into a point before filing... it works way better if you simply fold it flat off the nail like it shows in the video! then take your file and take off the excess with downward strokes. my most important recommendation is to not try refiling once you are done. i had a little bit of lifting on a couple nails, so i went over all my nails again... this caused them all to lift up all over! i'm glad i made some mistakes, though, so i can keep you guys from having to go through it :) because i did that, i only kept mine on a couple days. you can see the shine on these... it's so cool that they are so shiny with no topcoat needed! i got loads of compliments on these, Mama Pawlish is a huge fan :D what's nice is you can use them from either direction, so it's easy to make an accent nails with designs like these that don't have a clear top and bottom. *INNI Nails comes in a set of 30 pieces with 13 different sizes for both hands, from very small to very big so that both young girls and grown-ups can enjoy the perfect fit. Customers also receive a compact nail file along with instructions on how to apply the nail stickers and how to find your correct size. Custom sets retail online starting from $9.90 with free shipping everywhere.